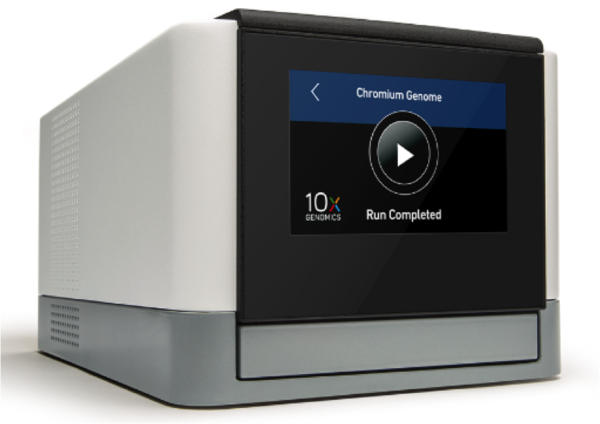 The Chromium Controller from 10X Genomics will be available at the Genomics and Bioinformatics Core Facility. Called the Chromium Controller from 10X Genomics, the tool is a massive sample partitioning and molecular barcoding system that enables thousands of micro-reactions in parallel, allowing the discovery of gene expression dynamics and molecular profiling of individual cell types, elucidation of gene regulatory mechanisms, study of disease pathogens, and characterization of genomic structure. The 10X Genomics tool complements existing equipment at the GBCF, which provides comprehensive services and support for state-of-the-art ’omics’​ experiments and bioinformatics analysis. The facility welcomes users at Notre Dame and beyond. Cost share funding for the new instrument was provided by the Eck Institute for Global Health, the Harper Cancer Research Institute, the Boler-Parseghian Center for Rare and Neglected Diseases, and the Center for Stem Cells and Regenerative Medicine. To learn more about the GBCF and their services, please visit http://genomics.nd.edu/.